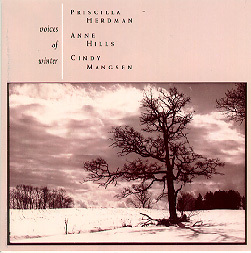 Herdman, Hills & Mangsen "Voices of Winter"
Take the warmth of a winter fire, the company of good friends and heartwarming songs from the past and present and you have this special collection of holiday music created, arranged and performed by Priscilla Herdman, Anne Hills, and Cindy Mangsen -- widely respected as three of the most enchanting voices in contemporary folk music. Separately, they have garnered the praises of radio hosts, critics and audiences across North America. Together, they interweave vocal harmonies which are at once soulful, hauntingly dramatic and rich with emotion. It is an album ideal for this time of year, when we all come together to share memories and dreams. "Voices of Winter" is a collection of songs of the winter season, taken from contemporary and traditional sources ... a journey through the ages with songs spanning more than seven centuries ... a sampler of songs that circles the globe. These songs are new, old, funny and — above all — memorable. A few of these songs will be familiar, most a discovery. This classic folk trio has developed an outstanding reputation for their ability to find and interpret exceptional music. Priscilla’s voice could be likened to a sonorous cello, while Cindy’s resembles the deep reedy quality of a clarinet and Anne’s high vocal clarity to that of a flute. Herdman, Hills & Mangsen blend in intricate harmonies; with their insightful selection of material and artful arrangements, this holiday CD will be one to remember and one to look forward to in each ensuing year. The trio collaboration of Anne Hills, Priscilla Herdman and Cindy Mangsen first came about on stage, almost by accident, in the late 1980s. In addition to their solo releases, they released one trio CD, “Voices,” in 1990.